After a whirlwind ascent followed by a much needed breather, breakout local indie/electro pop duo Cherub returned this year with a string of excellent new singles and their first tour in over a year a and half. One of Nashville’s coolest underground success stories, the band haven’t played a proper hometown headliner since a New Year’s Eve outing at the end of 2016, which has us extra excited for their Music City return tonight, Dec. 14 at Marathon Music Works, where they’re sure to entertain with some fresh jams! Joining Cherub are buzzy local up and comers NAWAS and kindred spirit and party fixture Meth Dad, making this one seriously epic party to help wind down the year as we head into the holidays. Tickets are still available here while they last, so snag yours now and read on for more about the show! Formed back in 2010, a few years after bandmates Jordan Kelley and Jason Huber first met while attending MTSU, local electro-indie pop duo Cherub have, without a doubt, been one of the most impressive Nashville musical success stories in recent years. A product of good old fashioned hard work and hustle, the band’s early online releases and party-starting regional shows helped grow a dedicated fanbase, and by their 2012 indie debut album MoM & DaD, Cherub had begun drawing an audience on the national stage. Blending acoustic and electronic tones, and drawing influence from ’80s synth pop, post-disco, traditional dance pop, and older, more rock-infused electronic sounds, Cherub have set themselves apart from the current EDM landscape by being more performance/instrument-based than many of their DJ-leaning peers, certainly finding fans in the electronic scene, while still tiptoeing genre-lines and crafting tunes with more staying power than a typical party band. After viral success for breakthrough early single “Doses & Mimosas” (which later piqued on the national charts) Cherub inked a deal with Columbia Records, who released their major label debut, Year of Caprese, in 2014, catapulting the duo to increasingly high-profile festival spots and television appearances, and amassing millions upon millions of streams. A whirlwind few years saw the band tour the globe, perform at drastically larger venues (including a hometown milestone of headlining The Ryman) and fests, brush shoulders with some high profile collaborators, step out with DJ gigs at increasing frequency, and even make some secret appearances (a few, memorably, under the moniker SnickleFritz), before dropping their second major label LP, Bleed Gold, Piss Excellence, in the fall of 2016. Cherub rocked a New Year’s Eve party at home that same year, their last Music City headliner, and, though they haven’t been totally dormant since, after a subsequent spring tour with The Floozies and some intermittent festival spots and DJ gigs, the group took a well-earned year and a half breather, returning a few months back with a string of exciting new singles, and recently hitting the road for their first tour since early 2017. 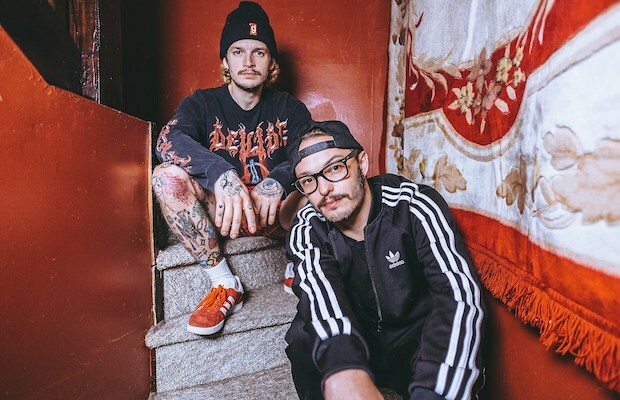 Though they’re sitting on an album’s worth of material, no record release has yet been announced, as Cherub are enjoying testing the waters with individual tracks. That means you’re sure to hear plenty of fresh jams along with old faves when one of Nashville’s most exciting breakout bands this decade make their long-overdue return home, ahead of what’s sure to be an exciting 2019. Don’t miss out! When we first introduced you to NAWAS, ahead of their bow at the first-ever Pilgrimage Fest in 2015, the group, led by soulful vocalist and New Orleans native Jake Nawas, were brand new to town, with little music to their name and even less info to report on. In their busy few years since, the trio have released some of the coolest electro-laced alt-pop and hip hop infused r&b jams to come out of the local pop scene, culminating in their buzzworthy debut EP, Trouble, last year. Rounded out by guitarist Ben McDaniel and drummer Joey Gonzales, the band’s layered, adventurous, complex, genre-bending, and earnest stylings have been drumming up widespread attention, and each time we’ve had a chance to see NAWAS live, they’ve managed to be more impressive. Though they boast a little less electronic bent or party-primed vibes than Cherub, they should nonetheless appeal to fans’ love of a good pop hook and smartly-crafted, instrument-infused jams, so be sure to show up in time to see what they’re all about! Nashville’s reigning king of party music and good vibes, Tyler Walker, who performs as Meth Dad, has long been one of the most fun examples of the broad range of artists Music City has to offer, and, without a doubt, one of our favorite local live acts. Walker’s been a fixture of the Nashville DIY scene for over a decade, and has been jamming as Meth Dad since ’09, performing sometimes alone, often as a duo, and occasionally with a full-on backing band and collective. In the blog’s early days, Meth Dad was a much more active endeavor; he never went away, but it took five years for Walker to followup 2013’s excellent LP Posi Vibes with this summer’s stellar Swate Drames, which, with guest spots from acts like Cherub, and all of the electronic, poppy, dance-primed, and positive flair we’ve come to expect, reminds us why we loved Meth Dad so much in the first place. This opening set is guaranteed to be a blast, so don’t be late! Cherub, NAWAS, and Meth Dad will perform tonight, Dec. 14 at Marathon Music Works. The show is all ages, begins at 8 p.m. (doors at 6:30 p.m.), and tickets are available to purchase for $27.